One of our latest creations – a heart shaped hot air balloon! This topper has to be one of the most unique ones we’ve ever had the privilege to create! 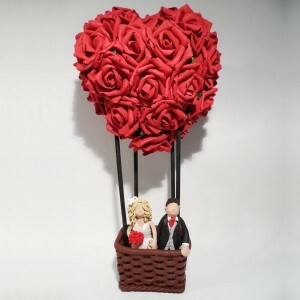 It was for one of my customers called Laura who came up with the idea of having her and her fiancé together in a hot air balloon but the balloon made out of red roses in a heart shape. I was so pleased with how it turned out and you’ll see how much detail went into it, especially with the basket. I think this must be up there now as one of my favourite ever toppers, it’s great when people want to push the boundaries and come up with something totally unique and I think this topper just shows what is possible!